A test of your ability to sell perfume! 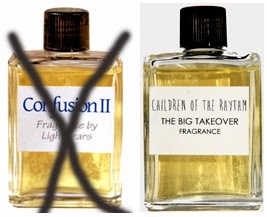 I'm running a campaign to find marketers for my perfume -- people who can take a bottle of one of my perfumes -- with their name and artwork on it -- and go out and sell it. My campaign is in the form of a contest and the prize is perfume. You can find the basic details here, and more information at my Perfume Strategies blog. Meanwhile let me share an insight with you -- not one that will be useful for the contest but one which will help you to understand, in the big world of fragrances, how companies select their licensing partners and distribute their fragrances. I am not going to give you direct links to follow. You will learn more by discovering them for yourself. But I will give you all the clues. Publicly traded perfume companies -- I am thinking in particular of Elizabeth Arden, The Limited, and Parlux -- produce annual reports and their annual reports can be downloaded, free, from their corporate websites. They are typically found under the heading, "Investor Relations." These reports can run over 100 pages. You don't need to read them from cover to cover. But, in these reports, you will find discussions of the fragrances the company sells, sometimes a few words about how they are produced (always by an outside contractor), and how they are distributed. This information is not likely to help you market your own perfume directly. But it will help you understand how large companies work with perfume. Making perfume is on thing. Selling it is another. To sell perfume you can either develop your own brand, so that sales bring credit and fame to your company, or you can "partner" (i.e., "make deals") with other companies to have them sell your perfume under their name and brand. The idea of building a perfume empire under your own name and brand is a grand one. But the path is a difficult one, strewn with failures. Why? Simply because the marketplace is competitive. Consumers have many choices. And to win their admiration and dollars can be slow, difficult, and expensive. This is why companies explore alternatives. I've written elsewhere about my own efforts to find marketing partners and even now, after the first successful partnership, I continue to be open to new and additional arrangements. Why? Because I enjoy making perfume, I've developed a number of formulas which I would like to get out there, to consumers, and I have neither the time, nor the organization, nor the money to risk to make a big push to develop the "Lightyears, Inc." brand. Thinking about this issue, the selling of your perfume under another organization's name, I stumbled across a bottle of perfume on eBay that was produced by Daggett and Ramsdell but marketed by the Fuller Brush Company. As best I could find out, the fragrance dates from 1951 which was a time when the Fuller Brush Man still sold Fuller brushes door to door. Magic Moment -- or any small, inexpensive perfume -- was an enticement to garner the good will of the housewife before launching into the Fuller brush sales pitch. Also note that Avon's roots involves a similar practice -- the giving away of a small perfume in order to pave the way for book sales. Daggett and Ramsdell, like Fuller, was an old, respected company but, while it had marketed a number of fragrances over the years alongside its cosmetics, the brand never become famous for their fragrances. Thus a marketing partner made good economic sense. 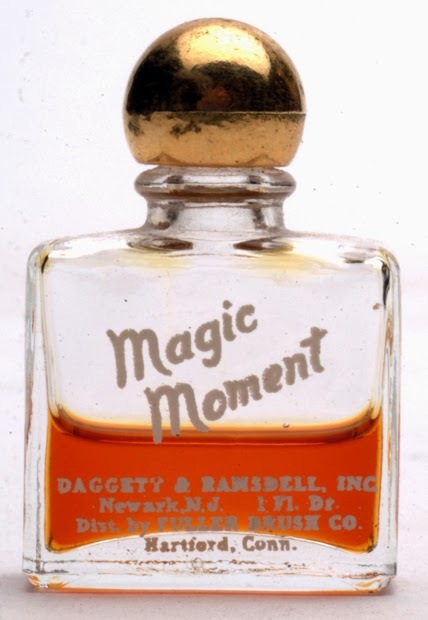 In addition to Magic Moment, Fuller also marketed a line of Daggett and Ramsdell cosmetics, door to door. But by the 1950's, the "Fuller Brush Man" could also have been the "Fuller Brush Woman." I've written in this blog about "Confusion II," a fragrance I created for a marketing test, but I didn't say much about that that test was. I've now shared full details with members of our Perfume Makers & Marketers Club through our February Club Newsletter. Now I can share some of the details with you. 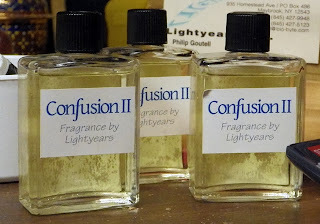 The plan for the perfume was to market it as a minor scale "celebrity fragrance" but to do this I needed a celebrity who would be interested in making "Confusion II," under their name, "their" own fragrance. The fragrance -- all of it for the test -- was ready in January. Finding a "right" celebrity took a bit longer than I had expected but now it has happened. "Confusion II" is no longer and from it, "Children of the Rhythm" has emerged, thanks to The Big Takeover. 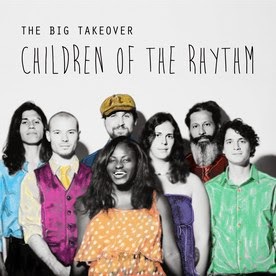 The Big Takeover is a reggae band out of New Paltz, New York. "Children of the Rhythm" is their newly released CD. "Children of the Rhythm" perfume took its name from the name of the CD. "Children of the Rhythm" fragrance made its debut last weekend on the band's merchandise table at their show in Hudson, NY. Like the music, the fragrance got good reviews and has now moved on to their online store. Of course you'll also find it on their merchandise table at future gigs. If you like music, you can play a few of their songs and watch their video at their ReverbNation page. They are a talented group and very professional. Now a few remarks as to WHY I sought out this marketing path rather than something more conventional, like getting the fragrance in a few local gift shops on consignment. My first point would be, local gift stores aren't going to do much for you by way of sales. If your relations with local people are good, you might expect to sell a few bottles -- but now enough to make a business. 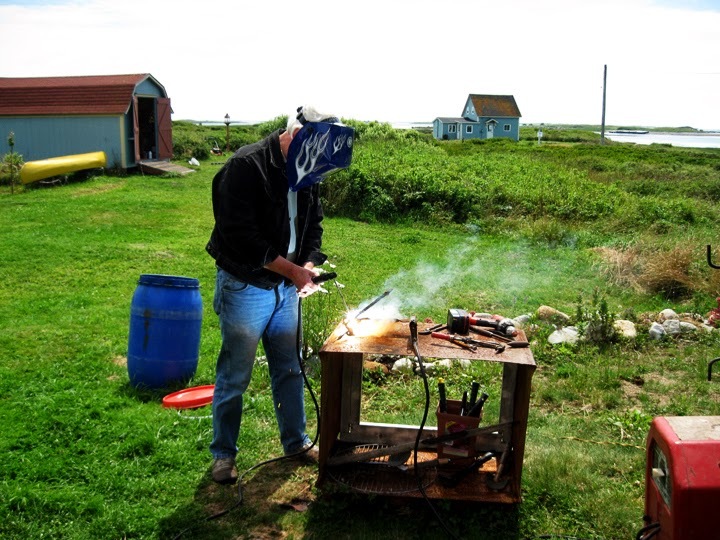 And when you try to expand beyond the local territory where people know you, what happens? -- Nothing! But look what happens with a band -- especially one like The Big Takeover that writes their own original songs. As their fame grows, their audience grows. Of course you can't expect the same type of sales that Justin Bieber or Taylor Swift get. But YOUR PERFUME is now being presented to more and more people with the hope and very real possibility that more and more of their fans will give it a try and even talk about it to their friends. Marketing perfume successfully is a strategy game. There's more to it than just creating a "good" perfume, whatever that is. Today more than ever there's money to be made with perfume. But for YOU to be the one making money, you must understand the strategy side of marketing. There are no magic templates. If marketing perfume is of interest to you, you really should sign up with the Perfumer Makers & Marketers Club to get our monthly newsletter. (It's just $21.95 for the first three months.) Discover what strategy is all about, and what it can do for you.